Do you have a problem with your beagle escaping? Don’t worry, we are here to help. Read on to find out how to combat this problem. How Is Your Beagle Escaping? There are lots of ways your beagle can escape. If your fence isn’t too high then your beagle could easily be jumping over. Beagles are also known to be excellent diggers. So your beagle could easily be digging an escape route under your fence. If you do find your beagle has escaped it is important to not get angry when you find them. This will only make your beagle scared. It will also make it harder to try and change their behavior. The important things is to find out exactly how your beagle is escaping so you can make the appropriate changes. If you make the following alterations to your property, the chances of your beagle actually escaping are low. Stopping your beagle jumping the fence: Increase the height of your fence. This will make it very difficult for your beagle to continue jumping over. Stopping your beagle digging an escape route: The best way to stop this is to bury chicken wire near the base of your fence. Or place large stones near the bottom of your fence. Both these methods will defer your beagle from trying to dig a way out. Fixing a hole in your fence to stop your beagle escaping is easy. The harder part is changing your beagle’s behavior so they don’t feel the need to escape. You need to find out the reason behind why your beagle is choosing to escape, and then take the necessary steps to change the behavior. If you only fix the holes in the fence and not the bigger underlying issue then your beagle will just continue in their attempt to escape. 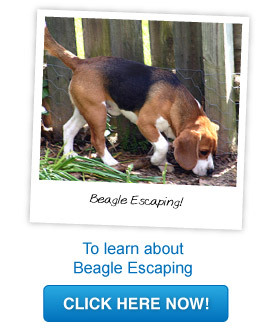 Read on to find out the reasons behind why your beagle might be escaping. Why Is Your Beagle Escaping? Boredom: If you leave your beagle for a long period of time without any contact or entertainment then they may try and escape due to boredom. If this is the problem then you need to make sure your beagle always has something to do. Make more time for your beagle when you are home – take them for walks and play games. If you do need to leave your beagle alone for long periods of time then make sure you leave plenty of toys to keep them entertained. By keeping your beagle busy, they won’t feel the need to escape. Breeding: If your beagle is male, when they reach sexual maturity at six months of age they have a natural determination to find female dogs. Because this drive is high, your beagle will keep attempting to escape. The best solution to this problem is to get your beagle spayed. If you do this it should stop the need to escape by approximately ninety percent. But, if your beagle has been escaping for a while prior to getting spayed then they may be in the habit of escaping and will continue to do it. So, the reality is you need to get your beagle spayed as soon as they are old enough. If you have a female beagle who escapes while they are in heat then you will probably end up with a pregnant pet! So, as with the male beagle, it is best to get your female beagle spayed as soon as they are old enough. Scared: If your beagle is scared of something then this could be the cause behind your beagle escaping. It could be something simple such as thunder and lightning or fireworks or building nearby your home. If your beagle is scared it could lead to anxiety. Once you have figured out what your beagle is scared of then you can take the steps to help your beagle. For example, if they are scared of thunder and lightning then keep your beagle in a quiet room during a thunderstorm to make them less anxious. Make sure your beagle has a safe haven such as a crate, which they can escape to if they are scared. This will help decrease the possibility of anxiety. Separation Anxiety: If your beagle escapes after you have left home then they may have separation anxiety. There are a number of reasons why beagles develop separation anxiety. These include having a death in the family, moving house, a change of your schedule or even after having spent time in a boarding shelter. One method to help fix separation anxiety is to leave your house for only five minutes and then return. Repeat, but each time increase the time you are away. Soon your beagle will understand that you will be returning and they won’t be so anxious. You can then easily leave your home for longer periods of time without your beagle escaping. If this does not work then you may need to consult a professional trainer who will help your beagle overcome their separation anxiety. If you are having trouble with your beagle escaping, it will take time to change the behavior. However, if you do take the time you will have peace of mind knowing that your beagle is safe at home and not in any danger. So take the time today and learn the reasons behind why your beagle is escaping. Then take the necessary steps to stop it! Soon you will have no need to worry about your beagle escaping!